Read THIS! 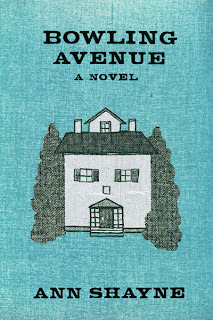 I spent the weekend reading Ann Shayne's new novel, Bowling Avenue. It was wonderful! It's full of great characters -- I identified with almost all of them, even the ones I didn't particularly like--with an equally great story, a flood, and even a little knitting subplot. It's simultaneously funny, sad, and bittersweet. You know, I'm a medical librarian and the word "self-published" strikes fear, or perhaps just derision, in my heart, but I guess Ann's self-published book proves that I should be a little more open-minded (although I'm still not sure about self-published medical texts....). I bought the Kindle version from Amazon, but it's also available in print from Amazon and Barnesandnoble.com (there's a Nook version, too). And if you have a favorite independent bookstore, they can order if for you. If you're not sure, you can read the first chapter for free -- if you're like me, you'll order it even before you're done with the chapter. Go do that now, and then I'll tell you about some knitting. I'll wait. Now, quickly before you start reading Ann's book -- remember long ago, at the end of my last post, I mentioned THAT gorgeous Tussah silk yarn I had ordered from DyeForYarn in Germany? I ordered it especially for Fragile Heart (Rav link, which seems to be the only link available) -- it was the yarn the designer used. The yarn is gorgeous, and a really good buy (about $35 for over 750 yards of lace-weight, and only $5 shipping!) I will definitely order from them again. The pattern was well-written, too, and I really enjoyed knitting it. 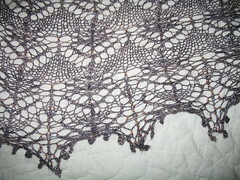 If you knit lace, it was both interesting and easy, if you know what I mean. I was never bored (except during the picot bind-off! ), but I was never frustrated, either. The shawl is beaded, which slowed me down a bit, but it was worth it. I used size 6/0 clear A/B beads that were lined in copper. 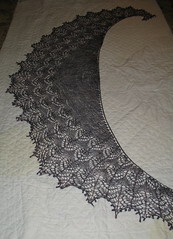 The designer, Boo Knits, has several other pretty shawls that I may need to knit, too. Closer up, although it's still hard to see the beads. Here's my Ravelry post, if you want more details. 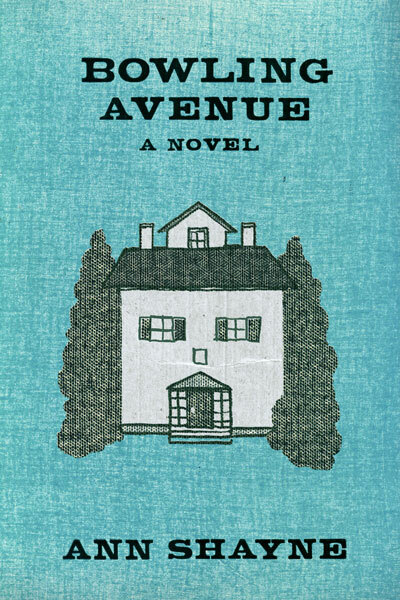 I've been meaning to buy Bowling Ave, just to support a good person, but this is the third positive review I've read. Amazon kindle here I come. I have to say, I was concerned the Wearwithall might have that "made with loving hands" look some self published books have, but I'm really happy with the finished product. Beautiful! I love the metalic look of this -- yarn and beads both. I agree -- beware of self-published medical book! Beautiful shawl!!! I love it! The shawl is lovely, but more importantly, I just downloaded the book for my iPad - I know you could've loaned it to me magically/electronically but I don't mind spending a few bucks for a good book by a neat person!